My greatest dream in life, like any Bhutanese dream, is to stand in front of my king someday with the guiltless satisfaction of having done my job well. For that I have been working every day in preparation, honing my skills, molding my attitude and defining my dreams. But I never thought I would be so lucky to blessed right here in the beginning of my journey. I was greatly honored and humbled to be granted a personal audience with His Majesty the King yesterday, August 10, 2014. This day shall inspire me in seeking meaning in my living, and I thank all the people who wished me well to see this day. I had a sleepless night of countless thoughts, I was struggling for words to describe that powerful emotion within me, it's like having won the Nobel prize. I was recollecting every word His Majesty said to me during the overwhelming two hours I spent at the Lingkana Palace. It gave me goosebumps remembering how much His Majesty knew about his ordinary subjects like me. It's so heartwarming to realize that the king is watching everyone of us everyday, he cares about our efforts. He knows who is doing what, no matter where in the world we are. He understands our ordinariness, and therefore the royal expectation of us is nothing extraordinary. He wants us to do the best that is ordinarily possible of us. Because so much is possible. His Majesty expressed his regard for my humble efforts, and reminded me of the long way that lies ahead of me. His Majesty wishes to see consistency, dedication and humility in what I do. 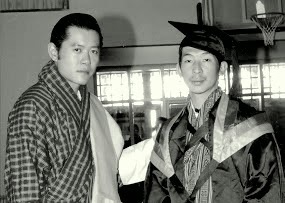 His Majesty gave his blessings on my blogging passion and inspired me to be socially active and responsible citizen. He advised me to remain locally useful and globally relevant at all times. The joy and fear of carrying the king's earnest words weigh equally and heavily on my soul, and I am going to put every piece of myself and every piece of this life to thank His Majesty in action. There is so much to do, and long way to go before I truly deserve the royal audience I was granted. Great news Passu sir, great that you got an audience with His Majesty. I see lot of inspiration in it. Congrats la. Congratulations PaSsu. I understand how that feels. Keep going, buddy. As always I am very proud of you! Tashi Delek! Good going Passu! Mighty proud of you! Thank you all the well wishers, without you i wouldn't have seen the great day. Every like, every comment and every thought is appreciated, these are the little things that keep me moving.